Over 45% of all the fuel burned by U.S. manufacturers is consumed to raise steam, according to the U.S. Department of Energy (DOE). Steam is used to heat raw materials and treat semi-finished products. It is also a power source for equipment, as well as for building heat and electricity generation. But steam is not free. It costs approximately $18 billion (1997 dollars) annually to feed the boilers generating the steam. Determine the efficiency of your steam generation system (based on steam output/fuel input). Determine how much steam you use, and how much it costs to generate this steam. Optimize excess air in your boiler to increase steam generation efficiency. Maintain clean fire-side and water-side boiler heat transfer surfaces. Optimize boiler blowdown to reduce Total Dissolved Solids (TDS) in the boiler system. Optimize your boiler control system to optimize steam generation efficiency. 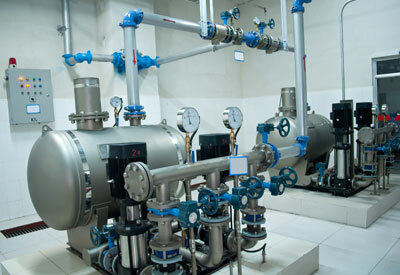 Ensure that an effective water treatment system is in place. The following resources, tools and case studies may help you move forward with optimizing your steam system. Article: Inspect Steam Traps for Efficient System. This article explains how steam traps work and methods to monitor them. U.S. DOE Report: Steam Trap Performance Assessment [PDF 149KB]. This report describes technologies for evaluating the performance of steam traps and estimates potential energy savings. The U.S. DOE offers tools for evaluating and identifying steam systems improvements. Minneapolis/St. Paul International Airport (2006). The Metropolitan Airports Commission investment in a steam trap monitoring system will payback in under two-and-a-half years. Schwan Food Company & Nordic Ware (2006). Inefficient and underused boilers were costing the two companies an excess amount in fuel. Rock-Tenn Company (2007). The paper mill insulated steam and condensate lines and saved $170,000. Tennant Company. Minnesota requested a MnTAP summer intern to tackle a waste and energy project.